The Ohio State University alumni, students, and fans have been known to tailgate party at university sporting events. 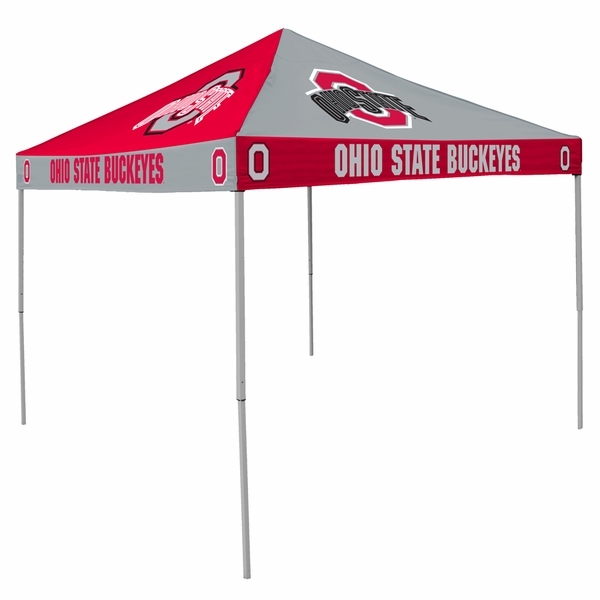 Make you tailgate party official with the Buckeyes tailgate tent canopy. This Buckeyes tailgate tent canopy is made by Logo Chairs and is made out of tough 200 denier polyester that is totally water resistant to protect you sun and rain. The name of the team and the teams logo is printed on all four sides. Set up by two people is quick and easy. What is the denier of this product? This item is 200 denier. Good quality great price perfect timing on shipping! Great transaction. Came on time and as promised. All sports fans should get a tent from this store! One of the telescopic legs were not functioning as designed. The spring held pin was not in place causing the leg to collapse. The graphics are excellent. Tent is great and as advertised. Carry bag handle tore off first time I tried to wheel it to tailgate spot. Needs to be a lot sturdier for this type of use. ConsHandle on carry bag not well built. Generally easy to setup and store. ProsEase of setup. Compact storage. I like the color combination on the cover. We opened it up after receiving the canopy to make sure everything was ok with it and nothing was broken or bent. We put it up and hen took it back down, to test it out. We did not take the cover off. So far, it is meets our expectations. ProsGreat way to let everyone know that we are part of the Gator Nation. ConsIt is only 9 ft x 9 ft. 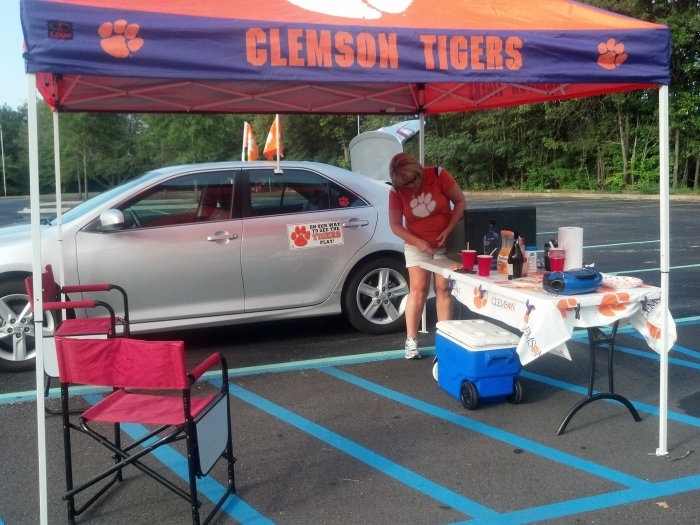 I know it is for tail gating, but it would be nice to have it avail able in a 10 ft or 12 ft size. Vibrant colors, sturdy construction, and absolutely gorgeous. We are the envy at all our son's Little League games. Every single game, a stranger will come up & compliment our canopy! Arrived fast & in perfect condition. Stands strong in the wind. This is a great tent and I'm happy to have it. Money well spent! Easy to set up. Getting it back in the bag is a tough job after a day at the ball field. The tent was everything that I was looking for. Easy to put up as long as you have a few helping hands. The bag that the tent goes in was really dirty though when I received it. Not sure if the box got damaged during transit or what but I was disappointed in the condition of the travel bag. ProsEasy to put up and take down. ConsDisappointed with the travel bag. Quick shipping. Product as described. The carrying case was defective and a new one was immediately shipped to me. The tent is perfect! Canopy shipped quickly. Seems sturdy. Team logo looks great. This product is exactly what I was hoping for. Received the canopy and was exactly how I imagined it. PERFECT! 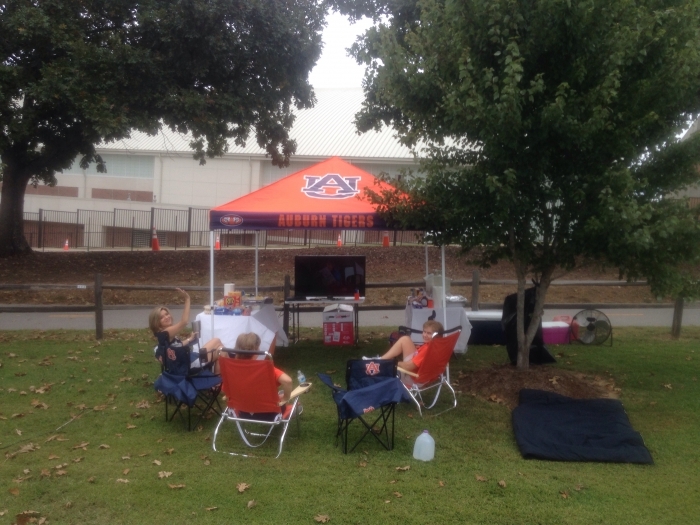 After tailgating with a cheaper brand of canopy with less than par results, we decided to give this store a try. To say we are satisfied is an understatement. It is built well and gets the job done. Once I ordered the tent it was shipped very quickly. Very easy to set-up and take down. ConsOnce the cover is on, it's hard to put in the bag so we have to take the cover off each time. Over all I think the canopy is very good. The only thing did I didn't think was excellent was the legs. The locking part doesn't work without playing with them. Excellent transaction. Will buy from again! Fast, good service. Good product. Very easy to set up. Colors were crisp. Sturdy. ProsVery easy to set up. Colors were crisp. Sturdy. ConsRed color faded on white in a couple pf spots. 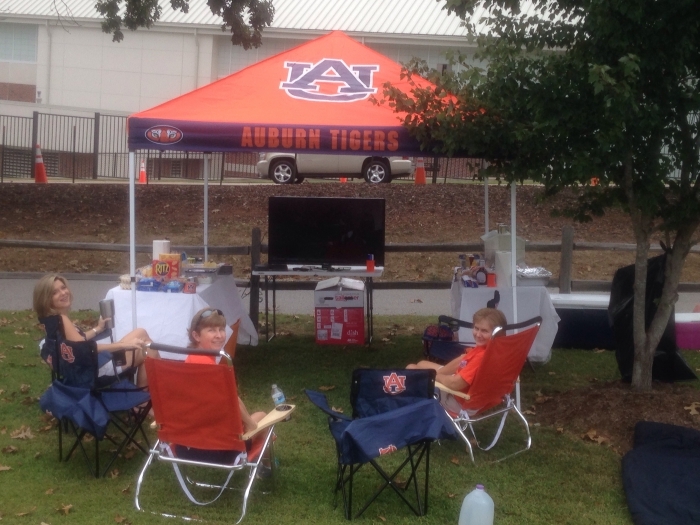 This is an excellent tailgating canopy especially for the price. Excellent product and of high quality. Very high quality canopy with distinctive top.